My publisher Packt is running a Buy One, Get One free offer to celebrate their 2000th title. You can buy my Google AdWords book “Advertising on Google: The High Performance Cookbook” and other tech books via this link http://bit.ly/1j26nPN. Learn how to run effective AdWords campaigns, build your website, and more using Packt’s library of practical tech guides. This entry was posted in Google AdWords, PPC and tagged adwords book, adwords books, google adwords book on March 20, 2014 by kristina. 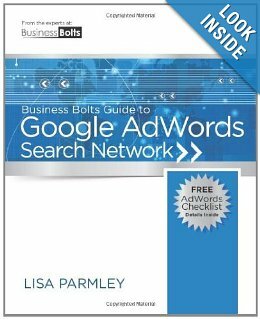 I’m excited to announce that I am featured in a new book on Google AdWords titled “Business Bolts Guide to Google AdWords Search Network.” The book covers how to get more traffic and leads from the AdWords Search Network. It includes basics of the system as well as optimization techniques and tips that will help you maximize profits. Over a dozen experts were interviewed and their tips are featured in this comprehensive guide. Learn from the industry gurus how to make your campaigns a success. You can get a book sneak peak with top strategies from 15 AdWords marketing experts in this article and you can now buy the guide on Amazon. This entry was posted in Google AdWords and tagged adwords book, adwords guide, google adwords book, google adwords guide on September 4, 2013 by kristina. 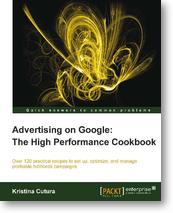 Readers would be pleased to know that I have teamed up with Packt Publishing to organize a Giveaway of Advertising on Google: The High-Performance Cookbook. And 3 lucky winners stand a chance to win e-copies of their new book. Keep reading to find out how you can be one of the Lucky Winners. Overview – The book offers over 120 practical recipes to set up, optimize, and manage profitable AdWords campaigns. How To Enter? – All you need to do is head on over to the book page and look through the product description of the book and drop a line via the comments below this post to let us know what interests you the most about this book. It’s that simple. Deadline – The contest will close on July 31, 2013. Winners will be contacted by email, so be sure to use your real email address when you comment! Any questions, feel free to email me. This entry was posted in Google AdWords and tagged adwords book, adwords for dummies, free adwords book, google advertising book, google adwords book on July 8, 2013 by kristina.